Big fat swim challenge fail! It’s my first week of Being Sporty. So I thought a good starting point was to challenge myself to do something active every day for a week. I decided to swim. I am calling it my Swim Challenge Week. No sooner have I spent hours deciding what to name my ‘challenge’ and I’ve already failed it. I am here to ask for your forgiveness. Day 1 and 2 went well. I just went after work. On Day 3, I knew it was going to be a bit of a squeeze finding time for it as I was working early, going straight to Yaya’s 4th birthday party, then going straight to a leaving party for some work friends. But I thought I might be able to squeeze it in somewhere. Off I went to work, then off I went to the first party. 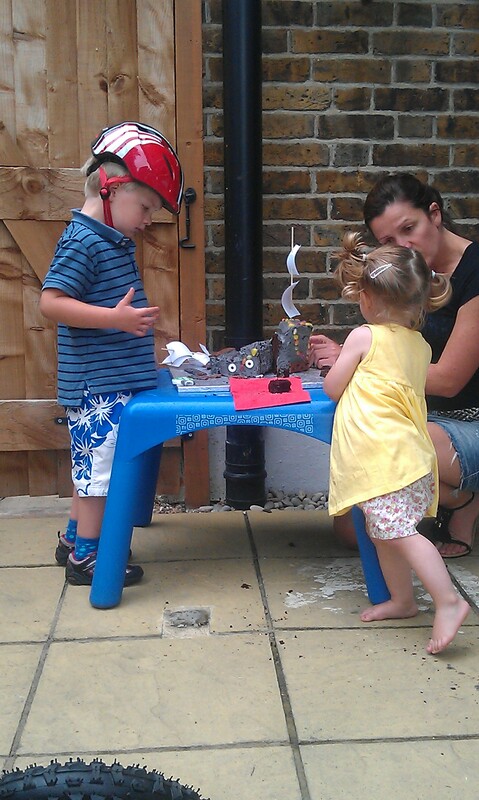 There was a pirate ship cake! There was a new bike! There were fun temporary dinosaur tattoos! (I obviously got one too. A stegosaurus on my left arm. I have officially joined the Cool Gang.) There was an amazing racing car game and a shooting gun thingy with foam thingies to fire at stuff! It was all huge fun. But it was getting a bit late. The work party wouldn’t go on forever and I would have to go straight from one to the other if I wanted to make it. But what about the challenge!? I couldn’t fail before I’d even been doing it for long! I panicked slightly. I thought about just writing a blog saying I’d done it anyway but I knew I’d be too nervous of being found out. Then I had a brain wave. I’d go to a swimming pool nearby and have a quick swim here, then when I left later I could just go to the second party, without trying to swim in between. So I pottered off to the nearest swimming pool. It wasn’t my local and it wouldn’t be outdoor with lovely trees around it so I could pretend I was on holiday. But it would be fine for now. I walk to the main desk and say I’d just like to go swimming please. The lady at the desk says… Are you ready for this?…. Fail! I don’t know whether she realised that, with that one little sentence, she had ruined my Swim Challenge Week and, hence, my life. Life ruiner. Ruiner of lives. I couldn’t stay for 45 minutes to wait and then swim and then go back to the party! I would have missed all the fun by then! I didn’t say anything for a while. Then I mumbled something or other about it being ok then I left. It was NOT ok. It was really annoying. There I was, ready to swim. Towel and costume in bag. Goggles at the ready (that’s right, I have invested in some goggles, this is getting serious). But no. No swimming for me. I weighed up my options on the way back to Yaya’s party. Should I give it all up, blame others for my misfortune, start living off fast food and become house bound due to my depression over being thwarted in my efforts? Or should I swim every day for the rest of my life to make up for the guilt of having missed a day? Or should I just keep going tomorrow and not stress about the missed day? I’d like to say I chose the last option but in reality I’m leaning toward a mixture of the last two. I swam this morning and did more than usual to satisfy the Swim Gods, who count your lengths and decide whether to punish you with a guilty conscience or not. In other news = when I went swimming this morning, I was midway through doing a whole load of back stroke when I realised I still had my ‘cool’ stegosaurus tattoo on my arm, which I’d been lifting out of the water a lot. If anyone saw it, they must have thought I was dinosaur mad. More news = Yaya got a bike for his birthday and had learned to ride it by the afternoon! Also, my name has become Lau-lau in babyspeak.